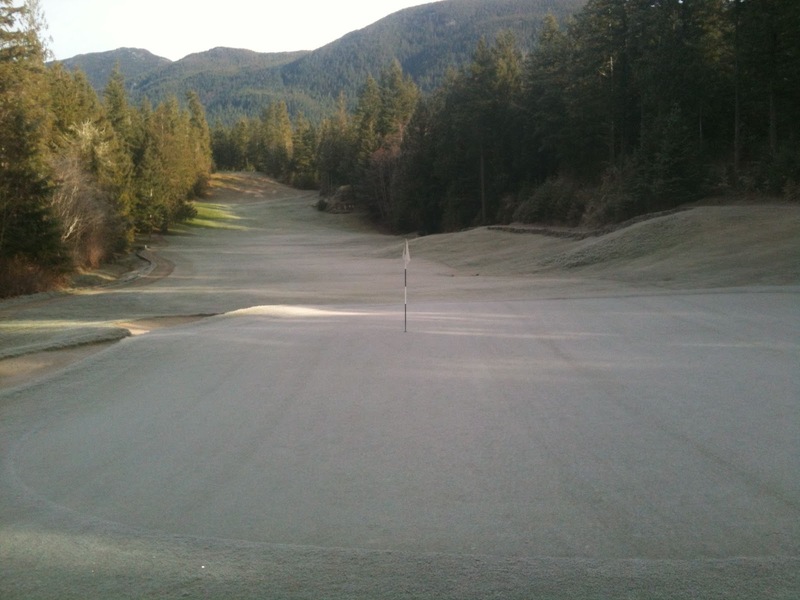 Today the golf course experienced the first day of sub-zero temperatures without frost. Usually with the high humidity on the West Coast we get a lot of frost if isn't raining this time of year. Sometimes we get low humidity combined with low temperatures and will not see any frost form on the turf. Even though the turf looks ok to golf on it might not necessarily be ok.
No golf on days like this. 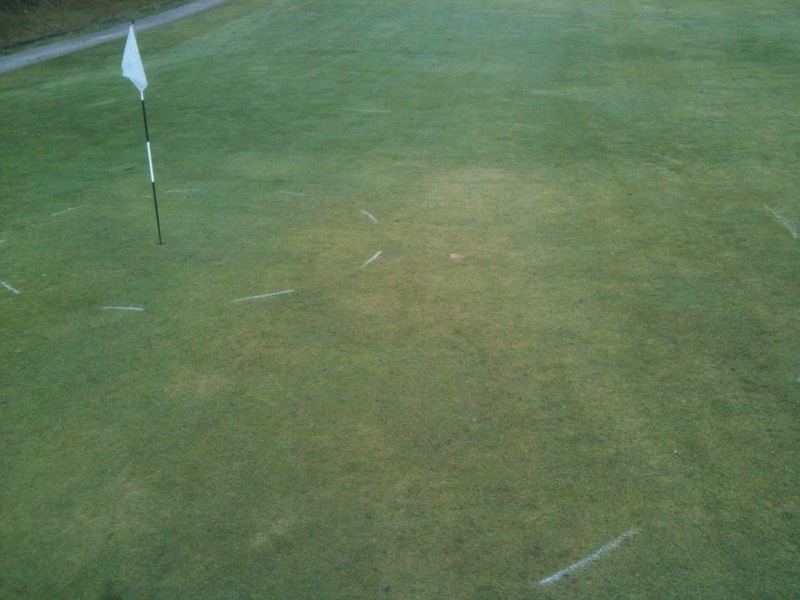 Frost damage comes from the physical shattering of the turfgrass leaves as well as the crown tissues (growing point). When the frost melts the turf is usually safe to golf on. When we experience frost-less mornings with freezing temperatures the turf is usually ok to walk on as the leaf blades are flexible and won't shatter. The greens, however, can be damaged from walking on if the ground is frozen. Frozen soil does not provide the same cushioning effect that unfrozen soil or thatch does. The fairways and rough have sufficient thatch that they are usually ok to walk on when the ground is frozen. The greens have almost no thatch and therefore the crown tissue can be severely damaged from being squished against the hard, frozen soil. Normally when we have frost on the course I will close the entire course to golfers. When there is no frost but freezing temperatures I will open the course for play but the greens will all be on temps. In the past we used to cut the temps to a lower height of cut than the fairways to make them better for putting on. 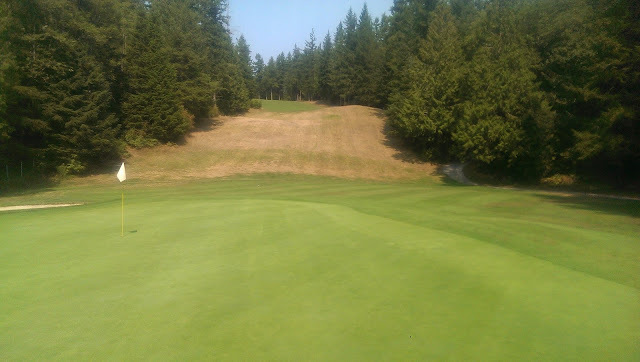 The problem at Pender is that our fairways are so bumpy that it often damaged the mower. Furthermore, no one wants to wreck the nice putting stroke they have been working on all summer by putting on temp greens that roll 3' versus the 9-10' on the regular greens. For these reasons I have elected not to cut the temps but to rather paint two circles around the temp pins. If you land your approach shot inside the outer circle you can call it 2 putts. If you land it on the inner circle you can call it 1 put. The inner circle is about 8 feet in diameter which basically gives you a 4 foot put. Believe me, this is generous, I see you putt every day. This will still allow you to get out and golf and will save your putting stroke for the real deal. It will also save the maintenance department a lot of time and money.